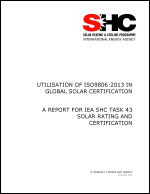 ISO 9806 Solar energy - Solar thermal collectors - Test methods, the international standard for testing solar thermal collectors, was first published in 1994. Since that time there have been advances in technology, resulting in a need for the standard to be updated. This update was completed in 2013. The thirty three member nations of the European Committee for Standardisation (CEN) have adopted ISO 9806:2013. This study investigates the likelihood that ISO 9806:2013 will be adopted in other countries around the world. To determine this, a survey which received 63 responses from 30 countries was conducted. Respondents were asked how likely their countries were to adopt the standard and what, if any changes could be made to the standard to improve it. Sixteen countries outside of the CEN membership were identified as having reasonably large solar market size and were targeted by this study as they are large contributors to the world’s solar market. Responses were received from thirteen of these countries, many of which suggested alterations to ISO 9806 in order to increase the likelihood of adoption in their country. These results will be used to inform the next revision of ISO 9806.